As Portland scrap metal demolition experts, we conduct most of our scrap recycling ourselves, which allows us to pass on as much value as possible to our clients. Like all demolition contractors with salvage operations, we keep a close eye on scrap metal prices. Multiple variables influence the salvage price of scrap metals. Basic Supply and Demand. As construction and manufacturing increase, so does demand for the products made with scrap metal. Prices tend to rise when demand is high. Low availability of scrap metal in the marketplace will tend to drive scrap metal prices up. Building booms in other countries can affect supply and demand as well. 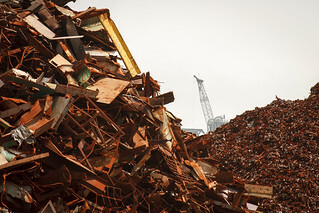 China, India, and Saudi Arabia are modern importers of non-ferrous scrap, for instance. Condition of Scrap. In general, scrap metal sellers will get higher prices for scrap that’s in good condition, i.e. clean and free of corrosion. Some buyers will not accept scrap that fails to meet these criteria. Careful categorization according to metal type allows demolition contractors to maximize their scrap salvage return. The Price of the American Dollar. A strong dollar brings in imports, as it makes other countries’ currencies look inexpensive to American buyers. The opposite is also true: If the American dollar is weak, foreign buyers will see American goods as inexpensive, and exports will tend to rise. When the American dollar is strong, scrap metal demand may fall in foreign markets. Visit EconEdLink for more information on how exchange rates affect trade. Current Prices for Virgin Metals. When virgin metals go up in price, you can expect a corresponding price increase in salvage scrap as well. As with all commodities, the going rates for scrap metals shift daily. A recent check revealed the following prices, giving a ballpark estimate of what you would face when selling scrap today. Please note that these prices are for the West Coast of the United States; scrap metal prices vary from region to region. Non-ferrous scrap metal does not contain iron. Non-ferrous metals tend to be used for lightweight applications, when some malleability is required. Copper, nickel, tin, and precious metals such as silver and gold are included in this category. Yellow Brass: $2.05 per pound. Nickel 200: $7.86 per pound. Ferrous metals contain iron; they offer high tensile strength, and as such are often used for structural support. #1 Heavy Melting Scrap: $370.48 per metric ton. 330 Stainless Steel: $2.75 per pound. Steel Casing: $461.83 per metric ton. In general, scrap metal prices are highest in places where there’s plenty of competition. When scrap yards can negotiate with customers and refineries, prices tend to be more inflated. As one of the largest scrap metal recycling outfits on the West Coast, you can trust Elder Demolition to score the best prices for scrap metal salvaged from your demolition project. This entry was posted in Scrap Metal Demolition and tagged Portland Scrap Metal Demolition, scrap metal demolition. Bookmark the permalink.